German-built Bavaria yachts are finding favour in New Zealand with a number of new-boat sales in the 34 to 44 foot range. Attention, however, is now focusing on the all-new Bavaria 36, a scaled-up version of the popular 34. Steve Raea gets behind the wheel of the 34. The Bavaria 34 was one boat test I was looking forward to. The German built mid-size cruiser received positive reviews when it was launched in Europe last Autumn and it has sold well ever since. So well, in fact, that Bavaria increased production from 700 to 1000 units a year. Despite near record sales, Bavaria opted to discontinue production, instead replacing it with the all-new Bavaria 36. The 34 and 36 are identical boats, offering the same accommodation options, engine, tankage, sails, rigging and gear. The only difference is size. Remarkably, the price of the 36 will be the same as the 34. More boat for your buck. New Zealand importer Roger Wilson says two 34's have been sold in Auckland and two new 36's have been ordered for arrival in October. They are, he says, essentially the same boat with the same systems and layout. The only difference below is a little more volume and twin galley sinks. The 36 has slightly less keel ballast but a marginally greater displacement. Sail area is also increased, but that is about the extent of the changes. My own interest in the 34 stems from its description as a mid-size yacht capable of offshore cruising. There is little doubt that the Bavaria is better engineered than some of the more popular French and American production yachts pumped out in their thousands to satisfy global growth in the charter boat market. This is not, however, to suggest that Bavaria Yachts don't make good charter boats. Clearly they do. They are roomy yachts for their size and cleverly designed. But all too often clever design can lead to compromises in a boat's structural integrity and, ultimately, her sea-keeping qualities. Bavaria appear to have given a lot of thought to the 34, particularly to hull shape and keel design which has come from the board of J&J Design, designers of Dufour Yachts from France and Grand Soleil from Italy and a number of fast one-design European racing yachts. The hull is constructed using Divinycell foam core above the waterline with pockets of kevlar added to the forward sections for additional strength and stiffness. The hull is hand-laid using a mixture of isophthalic and orthophalic resins with S-glass and woven rovings. The hulls are oven-cured. The interior joinery is fitted as a kitset and glued and screwed to the internal bulkheads. The deck and cabin top is also hand-laid glass with a foam core. The hatches and opening ports are laser cut by computer and the hull bonded to the deck with sikaflax glues. It is then screwed down from the outside. Nothing unusual here. The bulkheads are glassed in and the framework built from marine plywood. The chainplates are thru-bolted to oversize knees which look suitable for the type of loads experienced in offshore sailing. The keel is bedded on epoxy and the rudder and pedestal steering added last. The Selden kitset mast is stepped at the time of launching. With a displacement of just 4500kg, the Bavaria 34 is, at best, a moderate displacement keeler but with 1400kg of ballast in her cast iron fin-bulb keel, the 34 is a reasonably stiff boat and comfortably predictable in the gusts. 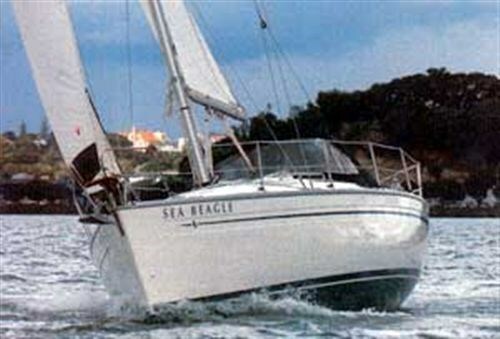 Lead keel and shoal draft option are available. While compared to some production yachts, the Bavaria might be considered overbuilt, it would not, in my opinion, want to be any lighter for offshore work or serious coastal cruising in New Zealand waters. The Bavaria comes with a factory backed five-year warranty on the hull. Terry Spitz, the Tauranga-based owner of our test yacht, Sea Beagle, first viewed the design at the Sydney Boat Show. He says he looked at a number of production yachts but was drawn back to the Bavaria by her internal volume and layout. While he has no plans to cruise offshore (been there, done that), he does plan to sail extensively between Tauranga and the Far North. 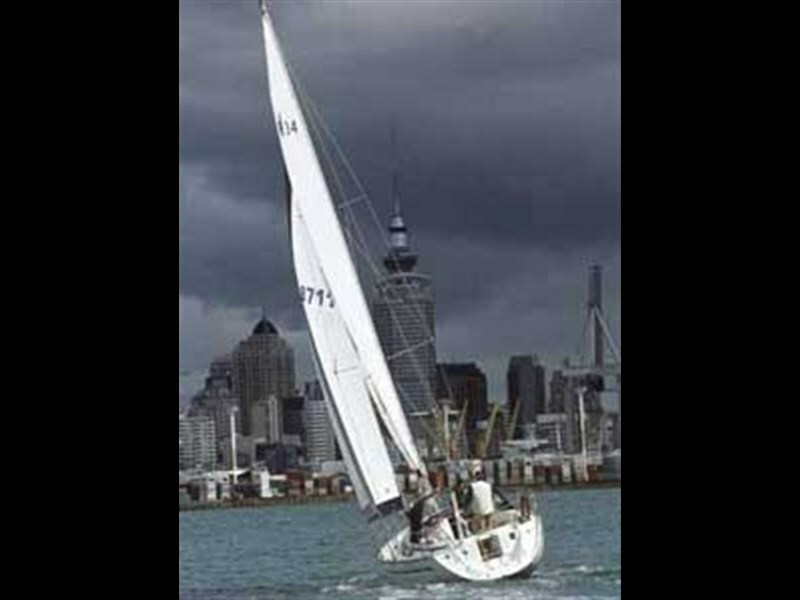 He also intends to race the boat with the Tauranga Yacht and Power Boat Club. Having recently retired, Terry plans to spend as much time as possible enjoying the yacht and sharing the experience with his family - something he says he wasn't always able to do when working. "It is for that reason I chose the Bavaria. The yacht has enough room for the family yet is manageable when shorthanded. My last boat was a 40 foot steel cruising yacht and required crew. Most of our miles were offshore. I feel it is time to discover our own coastline." Below deck, Bavaria's generous use of African mahogany veneer, the white moulded headliner and the teak-and-holly laminex floors combine to give the yacht a feeling of space more common to 40 footers. The dark-tinted and inward opening saloon windows set in the cabin sides tend to make the saloon a little dark but with the deck hatches open there is plenty of natural light to set off the glow of the mahogany. 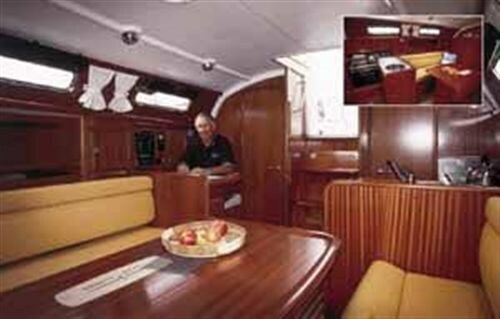 The 34 is available in two or three-cabin layout with owner Terry Spitz opting for the latter. The three-cabin version compromises none of its accommodation with double-sized berths in all three cabins. The head and shower unit is also large for the boat's size and well designed around the mast compression post. The galley on the port hand side could, however, do with more bench space for serious cruising and the chart table opposite is too small to take an open chart. The three-cabin layout begins with the double berth in the bow which is big and airy enough for an adult couple to sleep comfortably in any climate. There is about a metre of headroom over the berth and enough floor space to dress with the cabin door closed. There is good storage under the cushions where one of two water tanks is located. There is also generous storage in the solid wood-backed sidepockets that run down each side of the cabin. There is also a hold under a padded bumrest at the base of the bed and a fully-lined hanging locker with three shelves. Comforts come from an overhead hatch and an easy-cleaned foam-backed marine-vinyl headliner. The cabin door opens into the main saloon and therefore must remain closed to enjoy the full size of the saloon. This could have some affect on getting ventilation throughout the entire boat when in the tropics. The head and shower unit is on the starboard side, alongside the master cabin in the bow. The unit is fully-molded in white glass and combines low maintenance with generous space to move about the sink and sit on the loo. Taps and handheld shower fittings are chrome not plastic. A hatch within the head provides access to the sink seacock and water pump while another has twin shelves built in for personal items. Access to the plumbing is under the sink. The head on the test boat was the new Jabsco manual which is a vast improvement on previous models. An overhead hatch provides ventilation and there is a big plastic mirror for shaving. The real comfort begins in the saloon. Two 1.9m-long settees with lifting backrests run down each side providing storage underneath and giving access to two timber cupboards on each side. The saloon table has twin leaves that, when locked in place, create a table big and strong enough to cope with most onboard parties. A Bavaria insignia panel lifts out to provide storage for incidentals. Three decent size draws are also built into the table for cutlery, linen and the like. Grabrails are mounted along the window line on both sides for support when moving around the saloon in a seaway. Bookshelves are built in above the squabs with two cupboards at each end for storage. Ventilation and natural lighting is taken care of with six opening ports. These ports all open inwards which effectively means they must remain closed in any sort of weather. An inward-opening port on a sloping cabin side means only one thing - wet squabs. The nav station and chart table is on the starboard side. There is a small bench seat and timber facia for mounting electronics. A separate timber alcove has been built in to accommodate a fire extinguisher or EPIRB. Like most Bavarias, the electrical control panel is mounted on a timber door that opens to reveal the boat's electrical wiring looms. The wiring is tidy and accessible with colour coding. A number of wiring looms were also tagged. While short on bench space, the galley was well equipped and included a two-burner gas stove/oven, deep 12V chest fridge, rounded stainless sink and a pull-out kitchen tidy bin behind a cupboard. There is storage for crockery in two cupboards behind the stove with limited room beneath for pots and pans. There is running hot and cold water which can be heated by the engine or with shore power when on a marina. The Bavaria has no engine-driven refrigeration. The two aft cabins are each big enough for a couple and are provided with two opening portholes for cross-flow ventilation. Again these open inwards. Small hanging lockers with cupboard space for personals are built into each cabin. Again, the doors open outwards and, realistically, must be kept closed. There is good dressing space and generous sitting room above the berths. The three-cabin version would make a nice cruising boat, providing one cabin for storage and wet weather gear which is not catered for in the design. The three cabin version also allows for better tankage with a 150 litre water tank forward and a second 150 litre tank after set aft with a 90 litre diesel tank opposite. The Bavaria 34 is factory fitted with a Volvo MD2020 saildrive but New Zealand-bound vessels are fitted with the larger 29hp Volvo which are better suited to New Zealand conditions. The engine - swinging a three-blade featuring prop from Kiwi prop, pushed the boat through flat water at 6.8 knots at 3400 rpm. The engine was well insulated and smooth through the rev range. Engine access is an art form on the Bavaria. The companionway steps are hinged at the top and lift up on a gas-powered strut giving instant and easy access to drive belts and the water pump. Any cruising boat must have a sensible rig and Bavaria has opted for Selden spars which have been well proven offshore despite being a kitset rig. The double-spreader mast is set up with 8mm discontinuous cap shrouds and a single 7mm lower with a 6:1 adjustable backstay. The spreaders are slightly raked aft and the vang is a standard gas-powered strut from Selden. The furler is from Furlex. The 34 comes standard with a fully-battened main with lazyjacks and an overlapping headsail. Options allow for a furling main but with the corresponding loss in reefed sail shape and performance. A Spinnaker and pole are again extras. The sail wardrobe is from Elvstrom and includes just the two sails. Storm sails and a working headsail are extras and a must for serious cruising. The primary winches are two-speed self-tailing 40's from Harken and the halyard winches are self-tailing single-speed 18's, also from Harken. The sheet cars and jammers are from Rutgerson and the steering pedestal from Whitlock. The deck gear is good quality and big enough to do the job. The mainsheet traveler, however, is mounted across the top of the cabin top and is very short which negates its effectiveness. The mainsheet is handled by the single-speed winch on the starboard side and does not, as set up, lend itself to short-handed sailing or racing. It does, however, keep a lot of cordage out of the cockpit. The cockpit is well laid out and will accommodate four adults comfortably. The leather-bound wheel is well aft and the cockpit seats and combings are finished in teak. There are two very generous cockpit lockers big enough the take a 2hp outboard motor, cordage, lifejackets and the like. Further aft, a lift-out helmsman seat provides walk through stern access. A swim ladder is standard and drops into a recess in the stern molding. Anchoring is well taken care of with a deep self-draining cockpit and a 12 volt, 1000 watt horizontal capstan and gypsy. The engine control is mounted on the pedestal which also houses the standard Raytheon tridata electronics package and Volvo engine instruments. A fold out cockpit table is also standard fare and folds back neatly when not in use. The Bavaria 34 is obviously a very well balanced boat and benefits from the designers keeping weight in her ends to a minimum. The boat is reasonably stiff but not too stiff, allowing her to respond to gusts without over pressing the rig and sails. The helm felt balanced and positive with enough weather helm to give a feeling of positive control. With just 10 knots of breeze, the boat powered up well maintaining good sail shape, giving about 5.2 knots on the log to weather. As the wind increased, so too did boat speed with a good 6.5knots achieved in about 15 knots apparent. With sheets cracked, the Bavaria quickly fell into the groove and was light, balanced and easily driven. Interestingly, a 25 to 30 knot rain squall that swept in from the west livened things up for a while and, despite being over-powered, the yacht, stood up to the breeze for as long as it was asked too. I was genuinely impressed by her sure-footed feel and willingness to charge on. With a good set of sails and some minor adjustments to running rigging, the Bavaria 34 could mix it up comfortably with similar sized racer-cruisers. The deck layout is also good but the molded-non skid areas up front would not, in my opinion, provide adequate grip in any sort of weather. In summary, the Bavaria 34 is well appointed and well engineered and obviously a capable yacht. It is particularly suited to family needs with very generous internal volume. The cockpit is well laid out for cruising and the standard of finish is excellent. The boat has very good tankage, which lends itself to extended voyaging. I considered, however, that the nav station and galley were a bit on the small side. Storage is excellent, particularly in the cockpit. The three-cabin version would, I believe, make a very comfortable cruising yacht for one or two couples and would definitely come into its own at anchor when the hard work is done and the entertainment begins.